Although you may associate virtual reality only with video games, this innovative technology has a variety of other applications. In fact, researchers are looking at virtual reality technology in connections with the treatment of mental health problems. VR technology may transform the manner in which psychiatric problems are treated. The National Alliance on Mental Illness estimates that millions of Americans are affected by mental health issues every year. One in five adults experiences some form of mental health problem in any given year, according to data collected in 2015. More than 9 million adults suffer from a serious mental health problem that affects major areas of their lives. One out of every five youths experiences a severe mental health disorder at some point. Howover, many people do not receive the mental health services they need. In California, between the years 2010–2014, for instance, the majority — or just over 63 percent — of adults ages 18 and above with mental illness did not receive any form of counseling or treatment. The consequences of the lack of mental health treatment are severe, costing Americans more than $193 billion in lost wages each year. The third most common cause of hospitalization for adults ages 18–44 is mood disorders. Additionally, individuals who have chronic mental health issues die, on average, 25 years earlier than those without mental health problems. If mental illness is such an all-encompassing problem, then why isn’t it being treated more effectively? Part of the problem is that mental health treatment receives little funding. Although treatment options have increased in recent years, countries around the world experience difficulties in providing treatment to everyone who needs it. Virtual reality is a useful tool that may make mental health treatment more accessible to everyone. Although VR has never gained a strong foothold outside of the gaming market, it offers many benefits for the healthcare field, particularly in mental health. Research that has taken place over the last 10 years demonstrates the utility of virtual reality in providing therapy to those suffering from psychological ― and physical ―disabilities. The basics of virtual reality, a technology initially developed at the Massachusetts Institute of Technology during the 1960s, haven’t changed much over the years. VR technology involves a computer-generated image, which is displayed on a system that presents the information. A tracker feeds back the user’s orientation and position to update the picture. Although its basic premise hasn’t changed, both the affordability and sophistication of the technology have undergone dramatic transformation. In 1996, psychologists Albert Carlin and Hunter Hoffman published a follow-up study. This study, conducted at the Human Interface Technology Laboratory at the University of Washington, was published in the journal “Behavior Research and Therapy.” The results of that study suggested that virtual reality also could help patients with a debilitating fear of spiders. Since the earliest study took place almost 25 years ago, approximately 300 additional studies have been published examining the use of virtual reality in mental health treatment. Most studies have explored the use of VR in treating phobias and PTSD and other anxiety-related disorders. The results have been promising, demonstrating that VR often helps those suffering from these conditions. Virtual reality offers a realistic and compelling way to simulate the real-life scenarios in which mental health problems occur. It is especially useful in the treatment of anxiety and phobias. Exposure therapy, often used to treat fears, involves slowly and carefully exposing patients to the feared object or situation until they overcome their distress. When the patient realizes, after repeated exposure, that nothing negative has occurred as a result of the exposure, he or she is able to confront and gain control of the fear. Introducing virtual reality into exposure therapy sessions allows a patient with a fear of flying, for example, to “participate” virtually in a scene while wearing a VR headset in the “inside” of an airplane during a treatment session. During repeated immersion in the scene, sensors in the headpiece detect movement, so when the patient moves his or her head, it seems as if he or she is looking around the cabin of an airplane. The patient hears the flight attendants and pilots making announcements, just as would occur during a real flight. Virtual engines “shake” and “rumble” to simulate engines preparing for takeoff. Turbulence and descent are mimicked in a similar manner. For a patient with a profound fear of flying, the scenario would be enough to elicit anxiety or even a panic attack if it were real. However, after repeated exposures to VR sessions in which the patient emerges unscathed from the experience, he or she is able to overcome the phobia. Cognitive behavioral therapy, or CBT, refers to a type of therapy in which the therapist helps patients identify and change maladaptive thoughts to healthier thinking and adjust more easily to challenging situations. Research demonstrates that CBT, when combined with virtual reality therapy, is more effective than CBT used alone. One of the more popular techniques used in therapy is stress management or meditation, which helps patients learn how to relax and improve their mood. In 2016, Unello Design developed some virtual reality relaxation and meditation experiences for Oculus Rift and Google Cardboard. One is called Eden River, which comprises a relaxing nature experience, while the other, Zen Zone, is a guided meditation journey. Another relaxation app, called Guided Meditation VR, provides four different environments to enjoy during a guided meditation session. All of these VR experiences potentially can be incorporated into therapy. Virtual reality is helpful, not just in therapy, but also during patient assessment. Instead of the patient attempting to describe a fear of crowds, for instance, a therapist can more accurately assess this phobia by using a virtual situation. The ability to administer powerful, realistic situational examinations has the potential to make assessing mental health issues much easier and more accurate. Moreover, virtual reality can reveal information so deeply hidden that a patient may not even remember the event. Virtual reality offers many benefits for mental health treatment. For exposure therapy, the therapist can carefully control the amount of exposure in each session. So, for example, in the “fear of flying” scenario, the therapist can take the patient slowly, over many sessions, through each procedure involved during a typical flight, allowing the patient to master each level at his or her own pace. Additionally, virtual reality is convenient. It’s improbable that a therapist could board a plane with a patient to assist the patient in overcoming a fear of flying. However, with virtual reality, experiencing an immersive, very similar situation becomes a possibility. Moreover, virtual reality helps therapists maintain confidentiality. If a mental health counselor attempted to take a patient with an elevator phobia into a crowded elevator for exposure therapy, for instance, the therapist would probably breach patient confidentiality. With virtual reality, this is not an issue. The patient experiences a realistic scenario in the comfort and privacy of the therapist’s office. 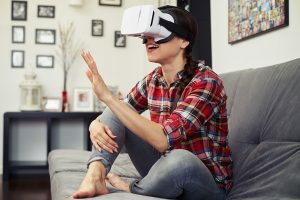 In addition, virtual reality therapy may be a less intimidating option for some patients than actual in-vivo exposure therapy, a form of cognitive behavior therapy used to reduce the fear associated with a trigger event. People who have extreme phobias usually avoid the trigger situation at all costs. Even though a patient might be opposed to in-vivo therapy, he or she may perceive VR as a less-threatening option. One of the biggest problems with virtual reality as a form of mental health treatment is its cost. Although the technology has grown more affordable, it is still expensive. One virtual reality therapy system, Virtually Better, sold for more than $6,000 in 2005. In 2017, the price is lower, but a simple iPhone version of that same brand sells for more than $1,000, while comprehensive suites, such as would appear in a therapist’s office, are much more expensive. Additionally, therapists may be required to pay a monthly licensing fee to use these systems. For a small private practice, costs may prove prohibitive. Another disadvantage is that virtual reality does not work for every patient. People who have difficulties focusing on a single activity or who are more easily distracted may find immersion in a virtual world an onerous prospect. Although it appears as if virtual reality has the potential to revolutionize mental health therapy, additional research is needed. Like any mental health treatment, virtual reality treatments must undergo rigorous testing in clinical trials. Some of the new directions for research may include ways to make the user feel a greater degree of immersion in the virtual experience, such as adding a tactile component. A 2003 study, published in the “International Journal of Human-Computer Interaction,” revealed that a combination of visual and physical experience proved much more effective than therapy with visual stimulation alone. A psychologist with the Virtual Reality Medical Center in California has experimented with this type of therapy by having patients touch a fake, yet realistic spider, while immersed in a VR world full of spiders. The psychologist reported in the “APA Monitor on Psychology” that the physical component helped improve the experience. Other researchers are studying the effects of virtual reality when combined with drug treatment. Psychologist Barbara Rothbaum and neuroscientists Michael Davis performed a study in which the drug D-Cycloserine was used immediately before virtual reality treatment. Previous research had led researchers to believe this drug can extinguish fear in rats. Rothbaum and Davis’s research, as published in 2016 in the “Archives of General Psychiatry,” demonstrated that subjects given a dose of D-Cycloserine before two sessions of VR therapy reported an improvement in the effectivity of the treatment. Research supports the theory that virtual reality can transform mental health treatment. It is efficient, effective, and confidential. As VR technology becomes less costly and more widely available, mental health therapy will involve it to a greater extent in the future.